Many parents find it difficult to connect with their children and are always looking for the right way to remain an active part of their lives. Saco resident Jill Kehoe said that poetry was the single device that allowed her daughter to express herself and reconnect with her mother. Kehoe now hopes to provide the same medium for teens in her own community. On April 5, the Thornton Academy atrium was transformed into part coffeehouse and part theater as the school held its first-ever slam poetry contest. Sitting just off the left-hand side of the stage was a proud Kehoe. 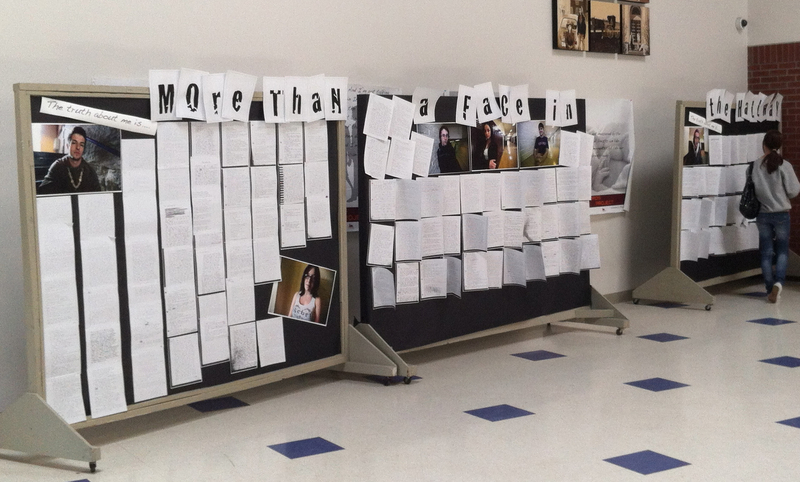 Kehoe and English teacher, Hope Hall, organized the event to celebrate National Poetry Month. They invited poets from Local Sprouts, a Portland-based, nonprofit, poetry group, to come to the school and conduct reading and writing workshops for the English classes. Almost immediately, Kehoe’s 13-year-old daughter started writing poetry. “For her, it was more therapy than anything else,” she said. With Gibson’s help, the eighth-grade-girl started to perform, and soon became a regular participant at the Local Sprout’s Tuesday night readings and slam poetry events. Kehoe said writing and performing was a way for her daughter to deal with issues and problems she otherwise would not have been able to confront. “It was a tough time for her and this was her way to communicate,” Kehoe said. 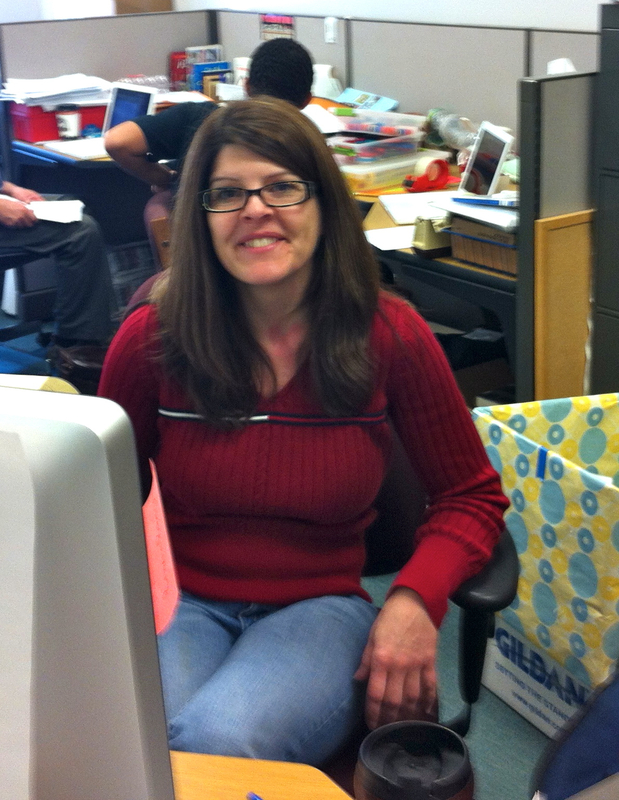 Kehoe works at Thornton Academy and is currently the director of the library and academic commons. After seeing how much slam poetry helped her own daughter, she wondered if it would have a broader audience. Kehoe worked with Hall and the administration at the school to create a month-long program in poetry that culminated with the slam poetry event. The program was divided into three sections. In the first part, host Nate Amadon (a partner with Gibson at Local Sprouts in Portland), invited student performers who did not want to participate in the slam portion of the evening to step forward and perform pieces. Because the poets in this group did not want to be a part of the competition, and their work was not given a score, they simply wanted to perform. The assembled crowd cheered and snapped their fingers (an action that is the equivalent of applause at slam events) as, one by one, students took the stage. The middle of the performance was devoted to a writing program that counselors at Family Crisis Services and Caring Unlimited have started at the Cumberland County Jail and Maine Correctional Center. Jenny Stasio, a counselor who regularly works with female inmates, told the crowd that the writing program has kept many of the women connected to the family and friends. “Some of these women have changed their lives and this program has given them something to hang onto,” she said. The evening ended with a slam poetry contest and, ultimately, four students were named to a Thornton Academy poetry team. Hall said the team would get together with other high school teams from around the state. “Sometimes they will compete, sometimes they will just write,” she said. Kehoe said she and Hall will try to organize another poetry event like this before the end of the school year. Because of the slam event and workshops held at the school, Kehoe now has more than 250 pieces of student work on display throughout the school. When asked if she has ever written or performed any of her own poetry, Kehoe smiled and said, “No, I just like to tag along.